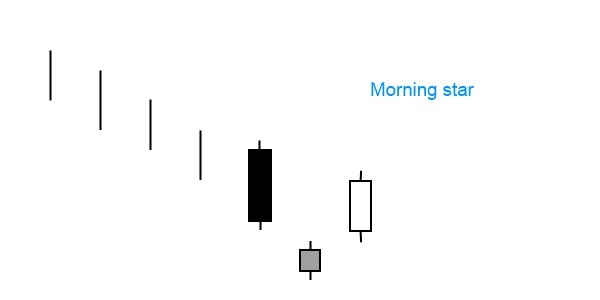 The bullish morning star pattern is a three candle bullish trend reversal sign. It consists of three different candles. A long black candlestick appears on the first day that continues the prevailing downtrend. On the second day a short candle forms (the colour is not important) that opens with a gap down. The flat body of this middle candle with a closing price near the open shows indecision on the market. It is interpreted as a sign that the market has lost impetus in the continuation of the downward price trend. The third candle in the pattern is a confirmation candle that comes after the appearance of the actual morning star. It is a large white candle that opens above the middle candle and closes near the center of the first candle’s body. Like its counterpart, the evening star, the morning star pattern appears as a cross-like star formation and is easy to recognize.